Today I want to write about a cool, unique bird, the flightless cormorant. These amazing birds grow up to 1 metre long. In their native habitat of the Galapagos Islands, they have no natural predators, so they don’t need to fly. They don’t have the muscles that connect to their breastbone that enables birds to fly. However, they are excellent swimmers, using their webbed feet to swim very quickly and catch small fish, eels and octopuses near the bottom of the sea. They build nests on the ground just above the high tide mark. The males bring gifts to the females to decorate the nests. 2-3 eggs are laid and the males and females look after the chicks. If there is a lot of food that year, the female will leave the male to look after the chicks and she will start a new nest with another male. 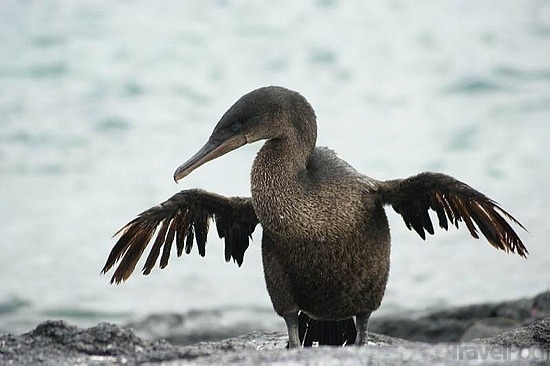 Flightless cormorants are found on just two of the Galapagos Islands. They are vulnerable to extinction due to the potential of introduced predators such as dogs, cats or pigs. Are there any other interesting facts that you would like to share about flightless cormorants?